A simply stunning Rhum Agricole from one of our all time favourite rum distilleries. 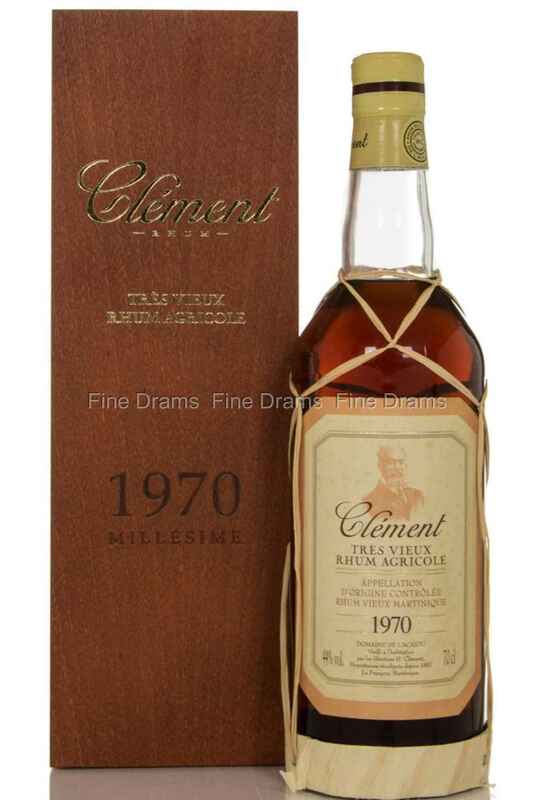 Clément was founded in 1917 by Homère Clément, who had purchased the 43 acre plantation thirty years previously (and whose portrait adorns this bottling). Clément is known for producing a high quality Rhum Agricole, made from the fresh pressings of the sugar cane, as opposed to molasses (which is the standard). This particular bottling is a beautiful 1970 vintage, bottled in 1991. The rhum spent 15 years in large 200 litre barrels in Clément’s large maturation cellars, before being moved to smaller French oak casks for 6 years, resulting in a marvelous concentration of flavor. This is a stellar Argicole, featuring all the grassiness one associates with that style, but accompanied by a tremendous depth of flavour. On the nose, the rum serves up deep, sugared fruits, with pineapple and mango particularly at the fore. The palate is consistent with the nose, but adds flavours of almonds, tobacco smoke and a slightly floral edge. The finish is long, with a strong toasted oak note and lingering sweetness. One of the all-time great bottlings from this distillery.